The question, “what kind of replacement windows should I choose for my home?” plagues us all, at least once in our lives. Replacing home windows isn’t a common home task—so, of course, most are unsure of where to start, who to talk to, what to look for, and how much to spend. Change is exciting! But, it’s a bit overwhelming when you’re unconfident in the pending changes. 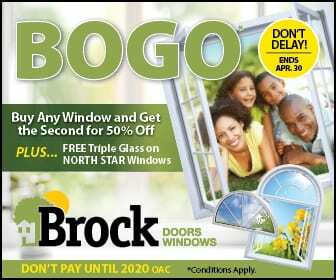 At Brock Doors and Windows, our team is highly experienced in guiding unsure homeowners in which steps to take. To get you started, we have compiled these helpful tips just for you! Read on! To avoid feeling disconnected with your personal space, make sure the replacement windows you select from Brock complement your home’s architectural style. For example, if you live in a cottage-style house, casement windows with decorative grilles are lovely. For an antique-style home, double-hung doors are perfectly vintage. Often, homeowners choose to undergo a window replacement project with Brock to bring more light and/or ventilation into their Toronto, ON homes. Before we begin, let’s look at this together—is there enough natural light in each space? Do you get the cross breeze you want? If not, let’s fix this. White home: be daring! Red, navy, black—almost any colour will work! Replacement windows are more than just light-givers and airflow-givers. They should be worked into the décor of your home in the same way a piece of art would be used. If you happen to have picturesque views, take advantage of them! We can custom build windows perfectly shaped and large enough to capture the outdoor beauty. If the architecture of your home is particularly unique, let’s find window styles, shapes, colours, and unique details to enhance your interior spaces. Bay windows (multiple pieces of glass placed together to form more floor space indoors) are an ideal way to add to your bathrooms, kitchen, and common areas for additional sitting space. If you still find yourself plagued by the question, “what kind of replacement windows should I choose for my home?” come and visit us here at Brock Doors and Windows. We would love to help you decide on the perfect new replacement windows in Toronto, ON!